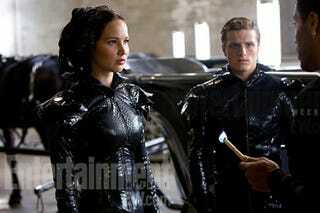 First look at Katniss' Fire Dress from The Hunger Games? There are a few pivotal moments from Suzanne Collins' The Hunger Games that the movie version truly needs to pull off, to win over the crowd. The Mockingjay's song and look must be perfect, or we (along with thousands of angry tweens) will burn the theater down. And Katniss Everdeen's famous parade dress, created by her government appointed stylist Cinna (Lenny Kravitz) is another important moment that this movie must ace. Why? Because her dress (along with Peeta Mellark's outfit) is literally ON FIRE. Behold the first ever look at Katniss' "Girl Who Was On Fire" Dress, mere moments before being ignited! Does it appease you Hunger Game maniacs? This official image is from Entertainment Weekly's latest issue. The Hunger Games will open in theaters on March 23rd.